Believe it or not, but there was a time when hip-hop and rap weren't two separate but closely related musical entities; in fact, there was a time when only one existed: hip-hop. I grew up listening to rap and had always gravitated to the more extreme examples of the genre, namely the intensely charged albums by Ice Cube. It would be actually be a combination of the Wu-Tang Clan's 1993 multi-platinum masterpiece, "Enter the Wu-Tang" and the year later release of the Beastie Boys' now iconic music video "Sabotage" that I would choose to research exactly where the sound I loved came from. My journey would take me back to a sound that is best deemed an instant classic, the sound of NYC in the late 1970s and early 1980s, a sound that crossed musical boundaries thanks to the likes of the always innovate Blondie. Hip-hop was and forever shall be a pure culture of rhythm and rhyme that saw its own subculture expand to include such household activities as break dancing and graffiti. 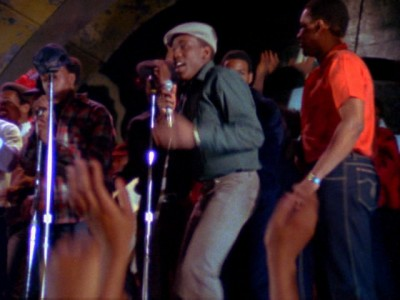 While there have been a plethora of films attaching itself to the overly commercialized "rap culture," for my money nothing beats the moment in time captured by films such as "Krush Groove" and the less polished but incredibly influential, "Wild Style." "Wild Style" is the brainchild of writer/producer/director Charlie Ahearn, who over the course of two years in the early 80s set out to make a film that captured the essence of the New York hip-hop scene set amidst the backdrop of the outlaw art form of graffiti. Employing true amateurs as actors, Ahearn's film loosely follows a protagonist who goes by the moniker of Zoro (actual graffiti artist "Lee" George Quinones). Representing the hip-hop scene is Phade (played by graffiti artist turned hip-hop icon Fab Five Freddy), a talented, but brash rapper with a solid connection to "the streets" which catches the eye of writer, Virginia (Patti Astor). In terms of writing and execution, "Wild Style" is a rough film, the plot rambles at times, shifting between the happenings of both Zoro and Phade, but in the end, the "story" itself is inconsequential, for "Wild Style" is an exercise in style and brings a whole new world to the masses. Ahearn's visual style is equally rough, but in taking a guerilla feel to filmmaking, "Wild Style" gives of a vibe of authenticity, capturing these (at times) exaggerated characters in their very real environments, offering viewers a glimpse into a previously unknown world. Chances are if you've seen a film attaching itself to the hip-hop or rap culture, there's at least a few elements innovated here, from break-dance battles (albeit nowhere near the absurdity of those portrayed in "Breakin'"), to rap battles, that find their way onto a basketball court evoking the trash-talk of the playground basketball scene popularized in the early to mid-90s in both "White Men Can't Jump" and "Above the Rim." However, it's the staged concert footage that cements "Wild Style's" legendary status, culminating in performances from a handful of notable groups including, but not limited to Grandmaster Flash and the Furious Five. As the credits roll, I'd argue that the finer points of the plot might be a bit hazy, but the pure essence of the film is incredibly clear in the mind, even hours, if not days later. "Wild Style" is more an experience than a polished film. Three decades later, with the film being celebrated with this deluxe anniversary edition release, "Wild Style" may be a hard pill to swallow for those who don't find the original hip-hop scene, even a hazy memory. The dialogue, most of which was improvised comes off as cartoonish and unfairly, for a new generation of viewers, I could see the film's impact being severely lessened in the way that films of the late silent era are sometimes unfairly discounted by those who can't see the historical impact. Yes, much of "Wild Style" is familiar ground, but that's because it broke the ground in the first place. Sure, if you need to fulfill your desire for a true hip-hop film, "Krush Groove" may be easy to gravitate to, but in my book, I'll take the raw feel and soul of "Wild Style" over the slickly produced, commercialized imitators that followed. There's not an argument to be made, that after 30 years, "Wild Style" is anything less than mandatory viewing. 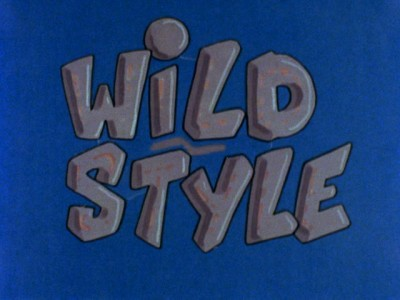 "Wild Style" boasts a newly remastered 1.33:1 OAR transfer. Given the film's 16mm origins, viewers shouldn't expect an overall stunning transfer, but colors are generally solid and while grain is prevalent, it has a natural tone overall. There are no signs of artificial digital tinkering to clean up the image and as a result, the film retains its raw feel to the core. The Dolby Digital English stereo audio track is generally clean, with as balanced of a mix as one could expect from such a low budget offering. There are very few instances of dialogue getting lost in the shuffle, although background effects on location sometimes are more noticeable to the ear; concert scenes fair the best with a solid reproduction of a live recording. Extras include a rather interesting commentary track from the director Charlie Ahearn and co-star Fab Five Freddy. Rounding out the bonus features are a handful of new interviews, graffiti footage, musical performances, the Wild Style 20th Anniversary Jam, a 25th Anniversary featurette, and photo gallery. Extras are spread across two discs with a physical booklet featuring photos and quotes on the making of the film rounding out the bonus features. Although not as comprehensive as some films, the quality of the commentary and interviews add to the significance of the film. There's not much more to be said about "Wild Style" if you're not sold on it yet. This 30th Anniversary edition offers some noteworthy bonus features and likely the best A/V presentation the film will ever see shy of a full HD release (and even then, I'm not sure the upgrade would be worth investing in). "Wild Style" is a must for loves of film and hip-hop alike, the rare, wholly influential offering that doesn't come around too often. DVD Talk Collector Series.